If there was any doubt in your mind that my family’s regard for animals is anthropomorphic, here is something to reassure you: Tango the parrot standing on his breakfast. He started this daily ritual by flying down and eating someone’s bread; now if we don’t lay him a place he tweets and flies round my head. Alma made them for her horse (he’s got a bad leg). I took one, it was good. over the weekend, and although I managed a few decent shots of a mist-covered lake, the wildlife shots were hopeless, except for this one – http://maxqnzs.com/tui.jpg The highlight of the visit was seeing an adolescent female tuatara ‘in the wild’, but even the two photos of that sluggish sphenodont did not come out well. I’d love to blame the camera, but I know that it’s more capable in more capable hands. Thanks, but in my case it’s very much got to do with having a good camera and using Photoshop. That’s a great photograph you took, but take a look here and — just to show you that it’s not just the camera or the photographer — I’ve adjusted the colour saturation and brightness of the birds. One thing I have noticed with both AJP’s and Robin’s (Caviar and Codfish) photography is how they are able to focus on things that are very close. Also the what-do-you-call-it depth of focus is very narrow so everything outside the two inch field is in soft focus. I took 18 pictures of my little garden slugs and only 4 of them are in tight enough focus to use, in spite of using the setting with the little flower on it. I suppose if I could find the English copy of my user manual and spend several more hours going through it, I might find some more pointers about the auto-focus, but right now my biggest problem is that my new netbook messed up two of my SD cards so that I can’t delete the pictures that are on them in order to reuse them. Yes, a good camera helps, and AJP has his wife’s camera (she’s an artist) but don’t let anyone tell you there is no skill in taking pictures. One of my favorite photos of myself was taken by an artist. One thing that helped me was taking a photography class at my local state university–it’s all about light. I’m just copying Robin. It’s really hard to take pictures of food that look as good as the real food does. You can see her technique at Caviar & Codfish, in the blogroll above. She uses a macro lens — they aren’t that expensive or bulky, as lenses go. Oops, yes they are, I just checked, $1,350. What’s cheaper and less bulky is called a diopter, or macro filter. I found a long explanation here (it’s about Canon lenses, because that’s what my camera is). Not to be outdone by Crown’s expensive gear and hundred dollar photoshop software, here is the same photo tweaked with the free Irfanview. There are better programs for photos as well–you can get some trial versions if you’re really interested. I use irfanview for cropping–it’s good enough for blogging. Also you can resize a 3000-some pixel photo to width of 500 if you want it to load on a page faster and be compatible with all browsers–you can’t see the difference on a screen. Yes, your pictures are amazing, and the parrot standing on his breakfast is irresistible. You linked that before, Nij. My brother’s closeup lens camera was obtained used from some flea market or somesuch–it’s an old model but he did the entire anniversary party slideshow on it (from old photos). He also jury-rigged a tripod and base to steady the camera for the dozens of old photos he took digital pictures of. No, it’s deleted but will probably show up for a while out of cache. If you want to fix it go ahead if you’re feeling that ambitious. I have to go wax floors for tomorrow’s move. The second one has an extra 2 in the file name. I would have eaten one of those cookies, they look very tempting. Thanks for the post-editing, tip, AJP. I have Paint Shop Pro Photo X2, which is similar to Photoshops Elements, and I also have the GIMP (which I love, being one). Part of my problem is that I don’t use my camera often enough to get familiar with its many functions, especially the manual controls. I shall try to clean up some of my photos a bit more though, and re-read my cameras manual. Thanks for the insipration. I think he only likes bread and butter (kept separate). I try to foist sweet stuff on him sometimes, since he doesn’t have to worry about his teeth rotting, but he’s not interested. There are always beak marks in the butter, though. I inspired myself into wanting to buy a macro lens, which was silly, because I can’t afford it. Yes they were good. I would have eaten more, but there would have been trouble. I like the way he climbs on to the rim of the plate, puts his feet together, and slides down towards the bread. I bought a mid-range compact (Panasonic FZ-18) because it offered a good range of manual functions including macro without the expense or awkwardness of a DSLR. Sadly, no camera manufacturer makes models for lefties, especially lefties who can really ONLY use their left hand. I’d love to be an animal in your family. A fish for instance. “it’s all about light.” Yes, Nijma, thanks for that. I think thta’s why I can’t get used to AJP’s wonderfully touched tui photo. The original was shot on a damp and cloudy day and reflects what my eyes saw. 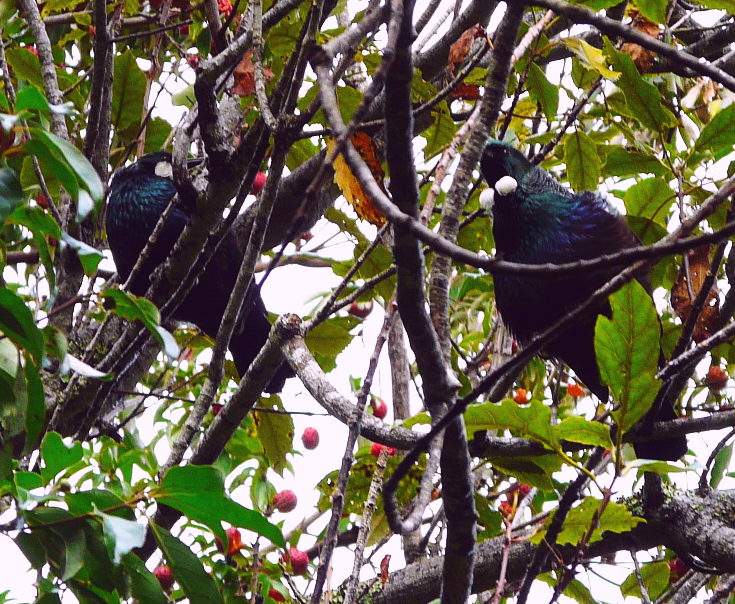 More than that, it reflects what my eyes are used to seeing, because even though tui are among the best-adapted native birds to modern urban environments and thus extremely common, I have NEVER seen one with colours as bright as the colours in Crown’s version. 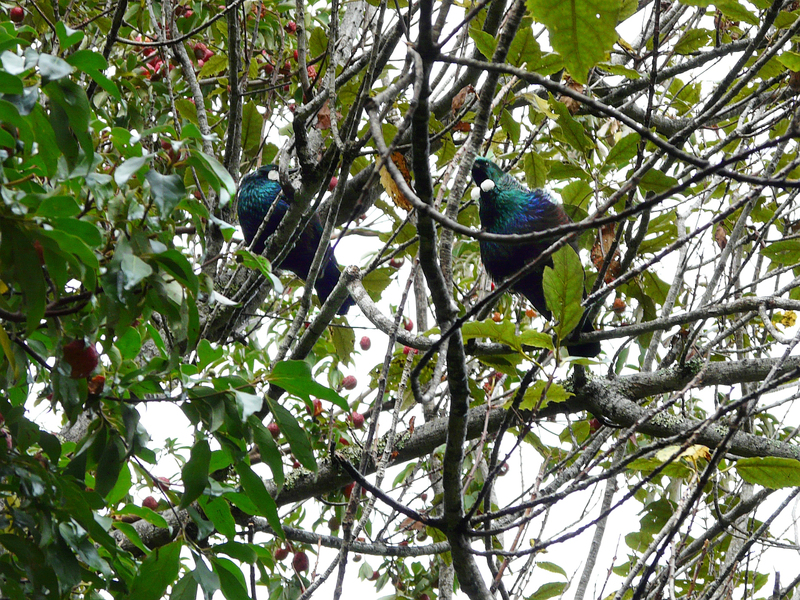 There is actually an old Māori myth that addresses the question of why so many native birds here have a rather muted palette. The colours in the edited version are gorgeous and do reveal that tui are much more interesting in hue than might be thought at first glance but they are just a soupçon too vivid. As a proof of concept, of course, the photo works brilliantly. Ah, unfortunately for me I’ve never seen one. How lovely that they are common, you live in one of those paradises like Sig does, don’t you? You can always just reduce the saturation, of course. Pictures taken against the light like that are usually a bit dark, but they often end up as my favourites, too. I’m not at all a photography expert, but I do know Photoshop well. It’s my favourite computer programme, but very expensive, as Nij said. A fish — the hunter becomes the hunted? Because of our family’s allergies fish were our first pet, but they jumped out of their tank on the staircase and tried to swim upstairs, like salmon going to spawn. We had to give them back to the (pet) shop. Not being a lefty myself, that problem had never occurred to me. I read something somewhere about a remote control for a camera, which sounds like it might help. I just read that Nikon tested a left-handed version of one of its models in the late ’90s, but didn’t produce it. Too bad. Who is hunting who? Mind you, I am a grass-eating fish, so I’ll compete with the goats only. Have you ever read Paradise News (David Lodge)? After you’ve read that book just the idea of having to live in a paradise makes you sick. I have, but wasn’t that set in Hawaii? Awful place, Hawaii, except for the volcano. It is not always convenient that both of us are lovers of the same Miss (Miss Word Press as the case may be). When I am connected, she decides what my signature will be and who Sig Nature must be. I find it a bit irritating. I believe it must be the same thing with Mr Blogspot. Damn bullies! I’m sure they’re all the same. Just sign out, Sig, then return to the blog. If you are signed out, you can use any email and any URL. I was supposed to move today, but the guy who was supposed to come over with all his buddies has disappeared. His tiny little daughter, who speaks perfect English, says they will move me tomorrow and sorry for the inconvenience. Now I will be expecting a really good price. I used GIMP years ago to do t-shirts in Arabic. It was awful. The slightest adjustment in the design could take up to 45 minutes to complete. Unfortunately it was the only program that would do Arabic characters. Maybe GIMP would work better now that I have a faster system and don’t have to struggle with dialup and 64 MB of RAM–I haven’t tried it lately. I think I would like to mention here a recent post on “OTOH” … http://otoh.org/xwiki/bin/view/Blog/PhotographingtheUnseen , and also the post previous to it, which also deals with photography. Quite possibly. They probably hear more of their wonderful songs than I do, too. Photos amazing and all animals and assorted living things adorable. Parrot sliding into first is very charming. Yes, it was in Hawaii. I’ve just met people who lived for several years in Hawaii and they didn’t think it was hell at all. On the contrary, they seemed to have enjoyed it a lot, especially the rainbows. Maybe next time, she can be prevailed upon to bake something for the humans in your family. It’s not hell. It’s just not as interesting as most tropical places, in my opinion. Apart from the volcano on the island of Hawaii, which is great (you can see inside the earth). An update: today he was offered two and spat them out. This means that we can eat the rest. I suppose I could just sign out and come back to the page again, but being the lazy animal that I am I find it being a bit of a pain. I’d much prefer to have the choice about who I want to be. Then you will have to change your wordpress info. I keep trying to change my wordpress email to the public one I put on the blog, but apparently I’m using it somewhere else that I’ve forgotten and it won’t let me change it. They probably listen to insects in a different way too.